Tommy Newsom's Craddock High yearbook predicted the 1945 Portsmouth graduate would become a successful bandleader. Millions of fans of The Tonight Show from the 1960s to early '90s would attest to how right the prediction was. Newsom's formal musical training began with piano lessons at the age of eight. When his father gave him a second-hand saxophone, he discovered a natural aptitude for the instrument. He learned to play without lessons. 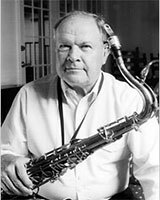 As a teen, he played in the high school band and orchestra and played sax in the Dave Parker band - a local Big-Band of the 1940s. He earned degrees from the Norfolk Division, College of William & Mary, Peabody Conservatory and Columbia University. As a serviceman, he played with the Air Force Band. Newsome began his professional music career in New York City, playing sax at the Taft Hotel with Vincent Lopez, in the television orchestra for the Merv Griffin Show, and on tour with Benny Goodman. He joined The Tonight Show in 1962, rising from band member to Assistant Music Director, and gaining renown across America as favored straight man to Johnny Carson's deadpan humor. The Tonight Show received five Emmy awards during Newsom's years with the show. Tommy Newsom has arranged and composed music for Skitch Henderson, Woody Herman, Beverly Sills, Kenny Rogers, Charlie Byrd, John Denver and other performers. His awards include National Outstanding Jazz Musician and a Cleo Award for his American Airlines radio commercial. Back home, his Portsmouth supporters honored him with "Tommy Newsom Day" in 1980.